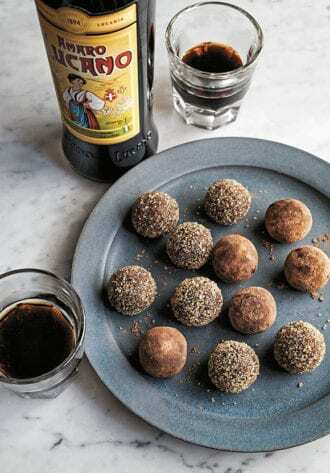 “Rum balls have always been a little too boozy for my taste, but mellowing out the alcohol with a lower-proof amaro brings an herbal, bittersweet depth without the sting in a rich and fudgy, truffle-like ball,” says Brad Parsons in his new book Amaro. His recipe for bitter amaro balls is adapted from Rhonda Ruckman, executive pastry chef of Herbsaint, Cochon Butcher, Calcasieu, and Pêche in New Orleans. Preheat the oven to 350°F. Spread out the pecans on a baking sheet and toast in the oven for about 10 minutes, until fragrant, being careful not to let them burn. Allow to cool. Add the toasted pecans and crushed shortbread cookies to a food processor and pulse until combined, then transfer the cookie-pecan mixture to a large bowl. Chop the chocolate into small pieces and place in a separate bowl. In a medium saucepan, combine the cream and corn syrup over medium heat, stirring constantly, until it comes to a boil. Pour the hot mixture over the chopped chocolate. Let it sit for a minute, then stir together until the chocolate is completely melted. Allow to cool for a few minutes, then pour the chocolate mixture over the cookie-pecan mixture, add the amaro, then stir together. Place the bowl in the refrigerator and allow to chill for 30 minutes. Place the Demerara sugar in a small bowl. Remove the dough from the refrigerator, and using your hands or a melon baller, form the mixture into small balls, approximately 1 inch in diameter. Dredge the balls, one a time, in the sugar, turning to coat completely. Transfer each ball to a baking sheet lined with parchment paper. Store in an airtight container in the refrigerator for up to a week. Yields about 30 balls. Reprinted with permission from AMARO: The spirited world of bittersweet, herbal liqueurs by Brad Thomas Parsons. Copyright 2016. Ten Speed Press.